Trim the spinach leaves and blanch them in eight cups of boiling water for two to three minutes. Drain and refresh under cold water. Squeeze out the excess water, cool and chop finely. Grind it and make smooth paste. Transfer into a deep bowl. In another bowl mash the paneer with a little salt and Divide into eight equal portions and roll into balls. Heat 2 tablespoons oil in a non stick pan, add the cumin seeds, garlic and green chillies and sauté. Add the gram flour and continue to sauté for 1 to 2 minutes. Add the spinach paste and salt sauté, stirring continuously, until the mixture is dry and begins to leave the sides of the pan. Set aside to cool. Divide into eight equal portions. 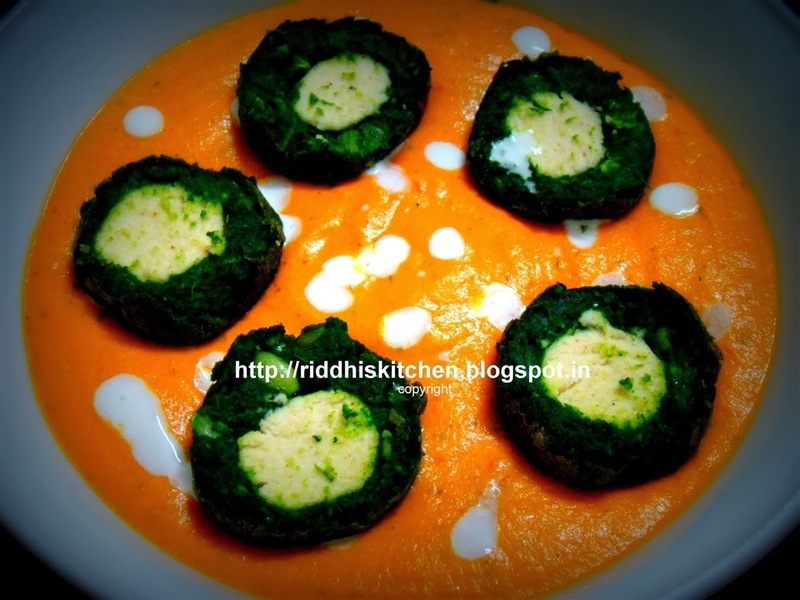 Take each spinach portion, flatten it on your palm and place a paneer ball in the centre. Gather the edges and shape into a ball. Spread the corn flour in a plate and rolls the stuffed spinach balls in it. Shake off the excess. Heat sufficient oil in a kadai. Gently slide in the stuffed spinach balls and deep fry on low heat for 2 to 3 minutes or till golden brown. Drain on absorbent paper. Heat 1 tablespoon oil in pan. Add Garlic, Tomatoes and saute for 2 minute on fast flame. Grind Them and make smooth paste. Take one pan and heat 1 tablespoon oil and add tomatoes paste. Add Red chilli powder, salt. Saute for 2 to 3 minute. Add butter, cashew nut paste and cook for 1 to 2 minute. Add dried fenugreek (kasuri methi) and honey to the gravy. Stir and cook for 2 to 3 minutes. Add cream and cook for 2 minutes. Pour the makhani gravy into serving bowl, cut the koftas and place on the gravy and serve immediately.